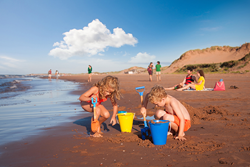 With nearly 700 miles of pristine beaches and the home of the beloved Anne of Green Gables books by Lucy Maud Montgomery, Prince Edward Island has long been a sought-after destination for families. Canada’s smallest province is also known as the country’s food island, boasting 600,000 acres of farmland, which also yields a mighty number of hands-on experiences for families that include farm visits, animal interaction, oyster shucking, and even cooking classes. Locally known as one of the cutest places on earth,Island Hill Farms in Hampshire is home to roosters, alpacas, miniature donkeys, bunnies, and more. The farm also hosts nine different varieties of goat, who wear knitted sweaters when it’s cold and often snuggle up to visitors. Families can catch a glimpse into life on a farm and learn about the importance of farming, animals, sustainability, and supporting local communities. There’s also a local store filled with fresh products, including homemade soaps from the goat milk produced on the property. The farm is open daily, the entrance fee is $10 per person and $6.50 per child (2-4-years old). Seafood lovers can take part in a farm-to-table experience with the Valley Pearl Oysters’ Get Shucked tour. Participants will practice tonging oysters, the process of gathering oysters off the ocean floor with long rake-like tools. After collecting oysters, the group will return to the plant to learn about oyster processing methods, practice shucking, and taste some of the world’s best oysters. Guests will learn from owners and competitive oyster shuckers, Jeff Noye and Damien Enman. This experience is offered July 1 – September 30 by appointment, from $90 per person. French fry lovers can visit the Roberts Family Farm for Taters, Tractors, and Tales to explore the island’s 200-year history of potato production. The farm maintains antique farming equipment from the 1800s, and guests can take a turn ploughing the fields or picking their own potatoes. The family farm has been in business for generations, allowing visitors to listen to their stories about the evolution and changes of the farming industry. At the end of the day, visitors eat a helping of fresh French fries. This experience is offered from June 4 – September 30, Monday through Saturday from 10:00am – 12:30pm, priced at $75 per person. This project has been made possible through funding provided by the Atlantic Canada Agreement on Tourism (ACAT). ACAT is a nine member pan-Atlantic initiative comprising the Atlantic Canada Opportunities Agency, the four Atlantic Canada Tourism Industry Associations, and the four Provincial Departments responsible for tourism.